Child bicycle senior of elementary school lower grade was replaced because it was damaged. Just changing the saddle makes it a new bicycle to make a mistake. Quality is also sufficient. This review is about item#36712173. I used it for 22 inch MTB for children. It was just right size. Edging of the back chrome plating, gloss of the sheet enamel is good. The child 's mountain bike saddle has torn. This is enough because genuine products are very expensive. I used it for repairing a child car, but I used it for a year, it has gloss and durability. I regret not being a toy. It looks shiny and received by children, price was cheap and received by parents. It is shiny and likes children. I used it for the saddle exchange of the bicycle of elementary school student. It was a saddle cover and I was using it as a teacher, but the child was delighted with the refreshing saddle. I got a bicycle for children, but cracks were in the saddle, so I exchanged it. I put it on a 18-inch bicycle, I did not feel any discomfort. It shines shiny and is pretty cool. It was good to change. I bought it for the exchange of a child's bicycle. Especially, it was able to be exchanged without any problem. The quality of the product was suitable for the price and was not particularly problematic. It is an impression that it is a little big for kids (20 inches). Sitting comfort is good, at this price this product is satisfactory. I replaced it because the saddle for children for CTB was torn. I thought if I should cheat with the cover type, but I think that this is a good price for this price. If the saddle is new, the whole bicycle will be a pretty impression and the child will be delighted. Purchased for the bicycle reproduction I got. Because there are many repair parts, we decided on this item with cost priority. It seems that the child likes it. I found this item if I was looking for saddle's stolen item with low price. I do not complain if you feel comfortable with this price. Both shape and surface finish are cool and I can not believe it at this price. 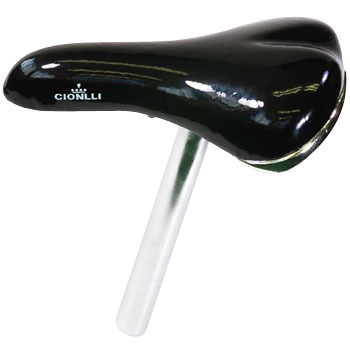 Since the seat post is fixed to the saddle, it is better if the seat post and the saddle can be used properly.